In 1997, after my fourth grade year, I went with my family on a trip to Europe. We flew in and out of Frankfurt, and spent a couple of weeks visiting Germany, the Czech Republic, Austria, itty-bitty Liechtenstein, and Switzerland. Frankfurt did not make a big impression on me, as we didn’t spend much time there and the city does not have much character anyway. (I was most impressed by Berlin, the city abuilding, where we spent the better part of a week.) One thing I do remember from Frankfurt in 1997 is the historic city center next to the Main River. In particular, I remember visiting a cathedral made of red stone that stood in front of a plaza. In 2015, on one of my trips out to India, Lufthansa gave me a nice long layover in Frankfurt, and I used some of the time to make an excursion from the airport to the city center by train. 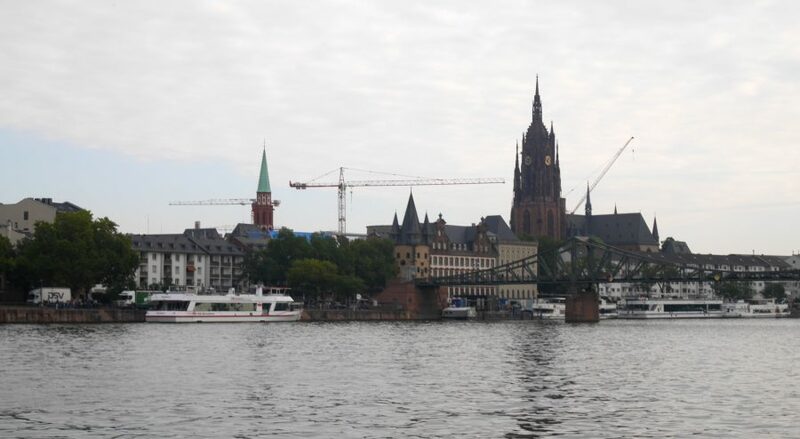 (For further observations from the same visit, please see my post “From fortress to Boulevard.”) The red-brick cathedral, the Frankfurter Dom, was there just as I remembered it from eighteen years earlier. But to my surprise, the plaza in front of the cathedral was gone! In its place was a construction site. A sign at the site explained that the area was being built up to restore its pre-World War II urban density. The plaza had only existed since the war, when much of Frankfurt was destroyed by Allied bombs. 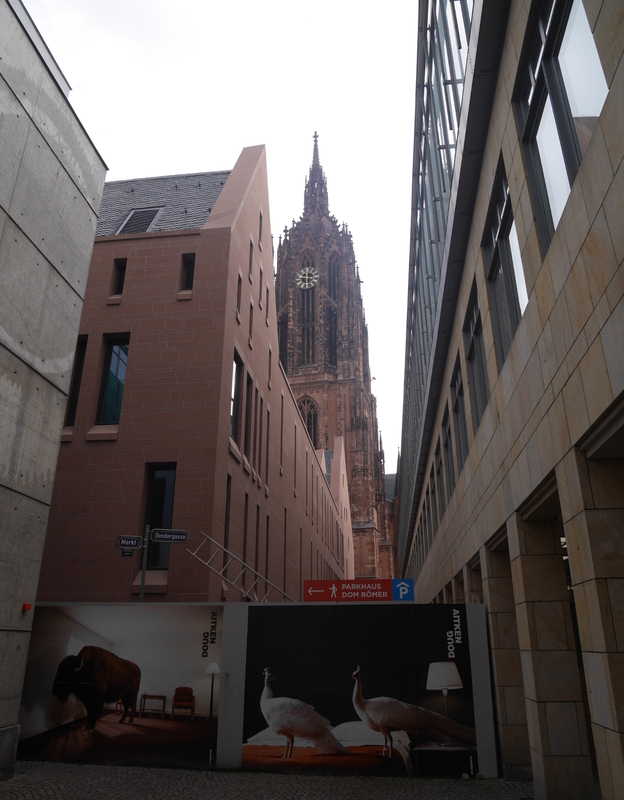 Glimpse of the Frankfurter Dom between newer buildings, as seen in 2015. 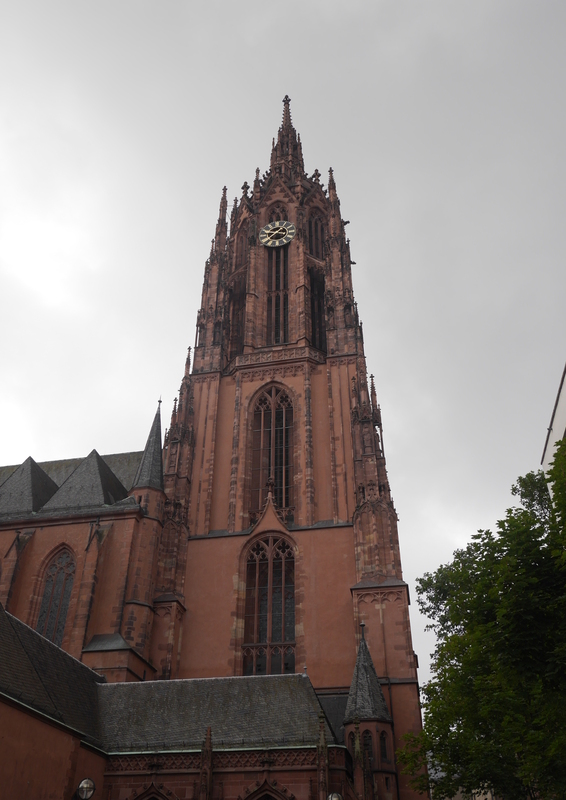 Tower of the Frankfurter Dom. I suppose the redevelopment of the former plaza in front of the cathedral is done by now. Lately, I have been thinking about how this project makes use of previously wasted urban space, opened up by the world’s worst war. In my own country, the United States, our cities have have their own share of wasted space, created not by bombs but by overzealous mid-century urban planners working in the name of urban renewal. I wonder if it is time to redevelop some of the big empty plazas in this country as well. 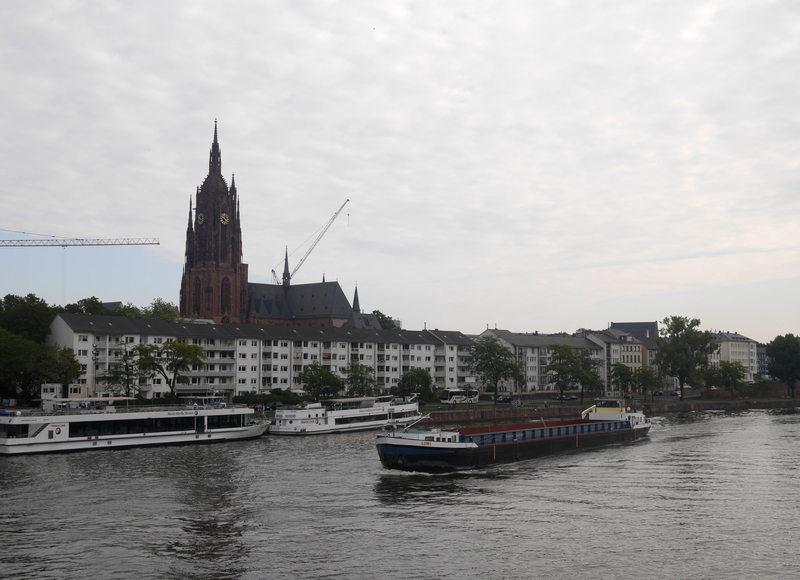 View of the Frankfurter Dom from a bridge over the Main River. 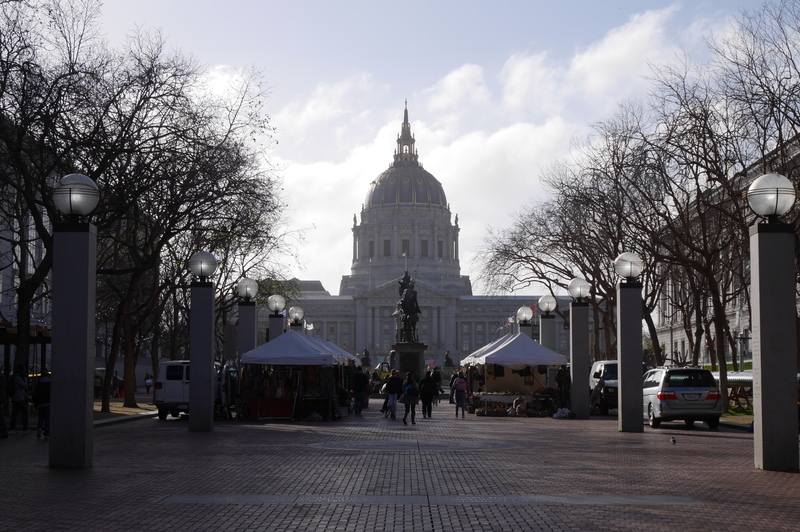 Just to the east of San Francisco’s grand Civic Center, UN Plaza is an unassuming pedestrian mall that hosts farmers’ markets and handicrafts fairs. Were it not for the name of the nearby BART (San Francisco metro) station, Civic Center/UN Plaza, it would be easy to miss UN Plaza among the grander spaces and buildings nearby—Civic Center, City Hall with its gold-trimmed dome, the Asian Art Museum, and the San Francisco Public Library. On either side of UN Plaza, behind the tents of the farmers’ markets, granite pillars are inscribed with the names of all member states of the United Nations, organized by the date of their entry into this global community. UN Plaza, San Francisco, with City Hall in the background. UN Plaza is located here because it is where the United Nations was founded. With the ratification of the UN Charter in the War Memorial Veterans Building just west of City Hall, the UN came into existence on October 24, 1945 — seventy-two years ago today. 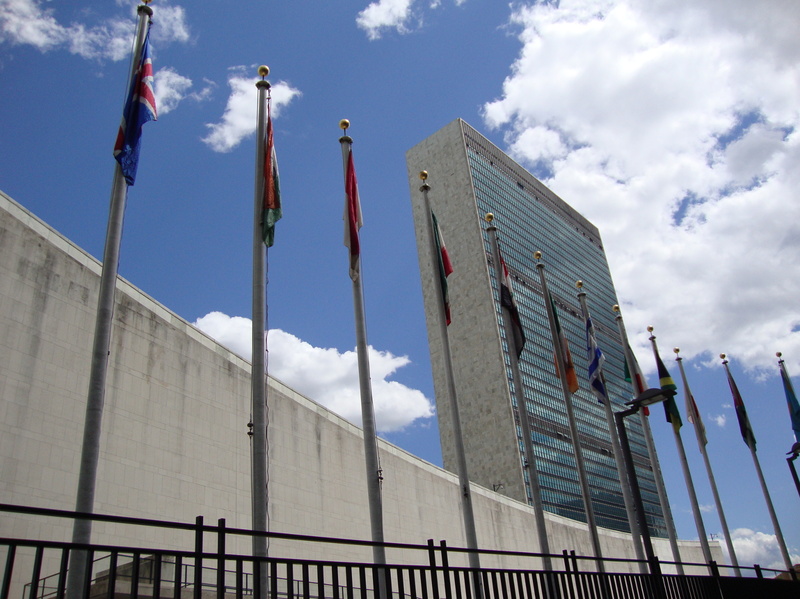 The first pillars in UN Plaza include the names of all fifty-one founding members of the United Nations. The names of the founding members include many names that one would expect to see on the list: Australia, Canada, Denmark, United States, USSR. But there is one name that doesn’t quite seem to fit: India. How could India have been a founding member of the United Nations in 1945 if wasn’t even its own country yet? India would be a colony of the British Empire for another two years. How could a colony join a community of sovereign states? The answer lies in the relations forged between India and the United States in World War II. As part of the British Empire, India qualified for lend-lease aid. The colony would serve as a staging-ground for the Allied war effort in the China-Burma-India theater. To coordinate aid shipments, the colonial Government of India set up a front office in New York, the India Purchasing Mission, in July 1941. It was the first official, government-to-government link between India and the United States. 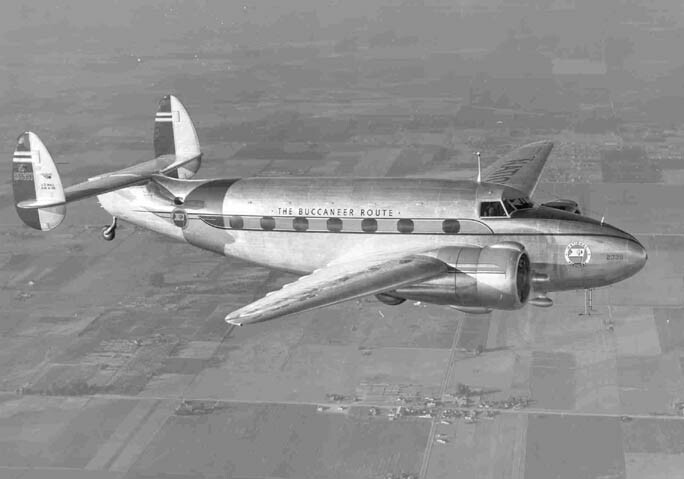 In 1942, the office was moved to Washington, DC and renamed India Supply Mission (ISM). Throughout the war, ISM coordinated aid from the United States and Canada to India. India Supply Mission continued to exist after the Indian Embassy was set up in Washington in 1946. After independence, ISM coordinated a different type of aid: development aid. From their office at 2342 Massachusetts Avenue NW, the bureaucrats of India Supply Mission saw to it that their country received the parts, equipment, and loan payments that industrialization demanded. United Nations Secretariat, New York City, with flags of member states in the foreground.